HC01. Baba Yaga - 5", the smallest - 1 1/4"
Baba Yaga, cannibalistic witch who is a stock evil personage in Russian fairy-tales. She lives in a hut, which stands on chicken legs and flies about on a mortar, propelled by a pestle, sweeping away her traces with a broom. Her character ranges from terrifying to benevolent, though her benevolence often depends on its recipient performing "impossible" tasks to her. 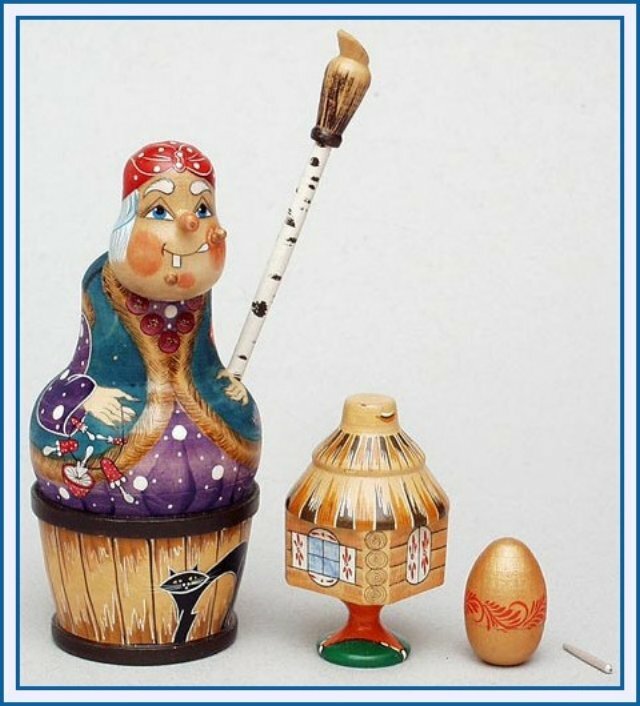 One of the ways to break the spell of the Baba Yaga is to find the needle hidden in the egg inside of the hut on hen's legs. In the Russian Fairytales the death of Koshchei Deathless is in this needle. In work the artists used tempera with egg emulsion and fine polecat brushes. Very calm and bright paints including gold are used. All the drawings of this item are made by the real artist so delicate and subtle that as a whole the doll is just breathtaking!